The Montana House and the Glacier National Park Conservancy are pleased to co-host another in the series of “Look, Listen & Learn” programs at the Montana House in Apgar Village inside Glacier National Park. 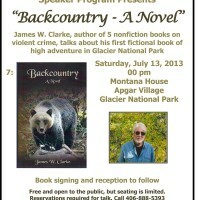 The featured author, James W. Clarke, is from West Glacier, Montana and Tucson, Arizona. His presentation will be at 7:00 p.m. Saturday evening, July 13, 2013. Clarke is University Distinguished Professor Emeritus at the University of Arizona, former Fulbright Scholar, and occasional consultant to the U.S. Secret Service. He is the author of a number of articles that have appeared in leading academic journals, and five nonfiction books on violent crime. Backcountry: A Novel is his first fictional book – a thriller story of love, murder, and high adventure set in Montana’s Glacier National Park. With his expertise of the criminal mind, extensive knowledge of the Crown of the Continent, and insight into Native American Indian traditions and beliefs, the book is a combination of outdoor adventure and high stakes suspense. One of the authors books, American Assassins: The Darker Side of Politics is a New York Times “Notable Book of the Year,” while another, Last Rampage: The Escape of Gary Tison, an Arizona Daily Star “Best Books of the Southwest” selection, is described in a recent survey of true crime literature as one of the six best books in the genre. The Glacier National Park Conservancy is the non-profit partner for Glacier National Park, whose mission is to preserve and protect the beauty and heritage of the Park for the use and enjoyment of present and future generations. 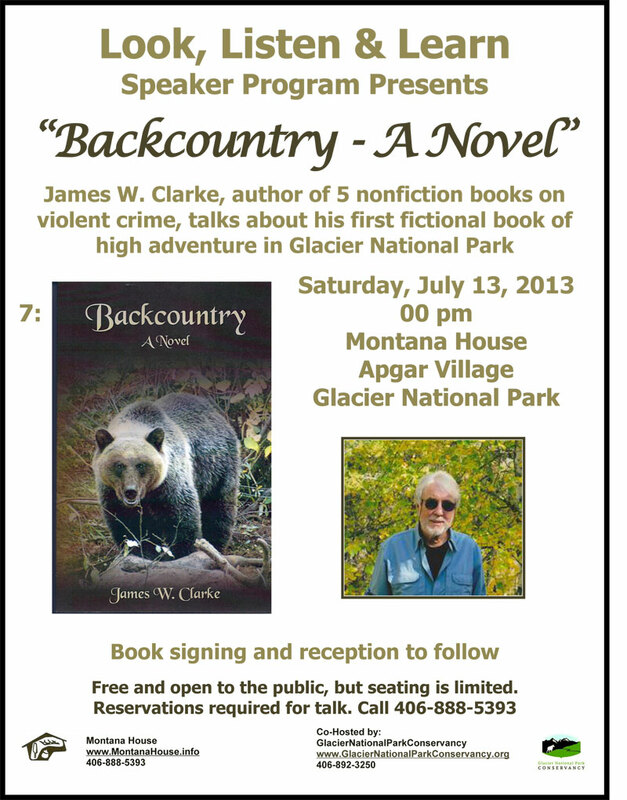 For further information, call: Jane Ratzlaff at 406.892.3250 or visit their website www.glaciernationalparkconservancy.org .